Few African animals will take your breath away like the mountain gorilla, and tourists can see them in the wild at numerous points throughout Central Africa. There are safety reasons for discounting places like Central African Republic, Democratic Republic of Congo, and Uganda, but additionally most tourists say Rwanda offers the best deals and most reasonable accommodations for gorilla trekking. Volcanoes National Park allows guests to choose between the luxurious Sabyinyo Silverback Lodge, the eco-friendly Virunga Lodge, or the more rugged Le Bamboo establishment. Rwandan tourists must currently pay a $750 fee in order to view gorillas. Nearly 500 live in the mountains straddling Rwanda, Uganda and Congo, 25 percent closely watched by the nearby Karisoke Research Center, a legacy of the late Dian Fossey. 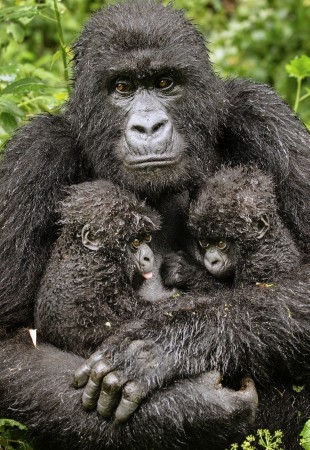 It is one of the largest mountain gorilla populations in the world. We've traveled far to get here. From the United States, through Amsterdam, into the Rwandan capital of Kigali, then a 90-minute drive across this mountainous, land-locked east African nation. Soon we'll see something few people ever will. Why travel to this faraway place where nearly 1 million people were slaughtered in a 1994 genocide the world took too long to notice? The steady, focused rebuilding effort led by President Paul Kagame has transformed Rwanda in ways large and small. Education. Business. Health care. Technology. Tourism. That's where mountain gorillas come in. "Our competitive advantage," one tourism official calls them. Another: an antidote to genocide. "When we are talking about mountain gorillas, conservation and tourism, we are talking with confidence," said Faustin Karasira, head of product development and planning for the Rwanda Development Board. During the war, a rebel group occupied part of Volcanoes National Park, but everyone agreed: Let's protect the gorillas. "They are so important to the country," said Juan Carlos Bonilla, chief operating officer and vice president of Africa Programs for the Dian Fossey Gorilla Fund International. "It's really beyond politics at this point." About 23,000 people visited Rwanda's mountain gorillas in 2012, helping make tourism the country's third-largest source of job creation. The Rwanda Development Board markets gorilla tourism around the world, and in 2005 launched an annual gorilla baby-naming ceremony, known as Kwita Izina, to attract attention, funding and awareness. 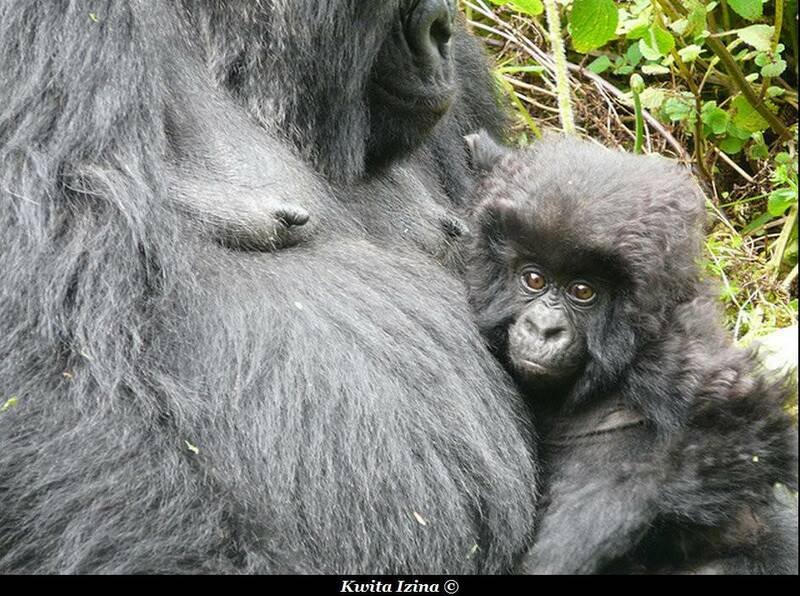 The gorillas have "been helping to position Rwanda as a must-see destination," Karasira said. Our lodge is not far from the park entrance, where we gather for instructions from veteran guide Eugene Twahirwa and Winnie Eckardt, a research associate at the Karisoke Research Center. Each group can be no more than eight people and only 10 groups go out each day. This is to protect the mountain gorillas from too much agitation and exposure to disease. The rules are simple. Stay still. Be quiet. Don't get closer than about 22 feet from a gorilla. If one approaches, back up. These rare, majestic creatures are gentle, no threat to humans. Guides say you are more likely to get hurt on the hike than be attacked by a gorilla. But they are large, so large, and you don't want to be run over by one. We drive a short way to where our hike starts. Each group heads to a different area so no gorilla group gets visited more than once a day. Here we're met by porters, children of ex-poachers who are paid to carry our supplies. Backpacks, jackets, whatever. The porters walk along with us, silent as they go. We're each offered a walking stick, which feels awkward, but no one turns it down. That mountain is high. Dian Fossey came to Rwanda to study gorillas in 1967, after the political climate in Congo became unwelcoming. She set up a campsite for research and named it Karisoke, as the center is called today. When Fossey was here, the mountain gorilla population was in decline. Most of the great ape species are, Bonilla said. Through international cooperation and conservation, though, the mountain gorilla population is increasing. "This is a flagship species and shows it can be done," Bonilla said.